Even before he began salsa dancing his way across NFL end zones, Victor Cruz was formulating a plan of success. The surprise story of the 2011 NFL season is well documented. Cruz flew under the radar of every team around the league before signing with the New York Giants as an undrafted free agent in 2010. In his first preseason game, Cruz torched the New York Jets for 145 yards and 3 touchdowns. He led all wide receivers that preseason in yardage and touchdowns. However, a hamstring injury before the start of the season slowed down the transition into stardom. Pick back up in 2011 when the Giants lose receiver Steve Smith to free agency, and only Hakeem Nicks was considered a reliable wide out. Cruz entered the season as Eli Manning’s 4th target on the depth chart, but injuries to Mario Manningham and Dominick Hixon propelled him into a larger offensive role. That year, Cruz broke the single-season Giants record for receiving yards, and was named Second-team All-Pro by the Associated Press. Oh yeah, he won Super Bowl XLVI that season, too. After winning Super Bowl XLVI, the New York Giants were treated to a ticker-tape parade in Manhattan, presented the keys to the city, and then honored in a ceremony at MetLife Stadium in New Jersey. Nearly one million fans attended the Giants’ second ticker-tape parade in five years, as they threw footballs from the sidewalks to the players, who signed them and threw them right back. In 2012, Cruz picked up where he left off the previous season leading the Giants in receiving yards and touchdowns. In his short career, Cruz has shown the work ethic and perseverance that marks sustained success in the NFL. He is as smooth answering questions from reporters in the locker room as he is running routes on the field. His teammates love his fearlessness and football intelligence. In addition, his presence off the football field is as electrifying as it is on. This past season, the world was shook by a crime of desperation at Sandy Hook Elementary School in Connecticut that took the lives of 20 children, including 6-year old Jack Pinto. Pinto was a Giants fan who called Cruz his favorite player. 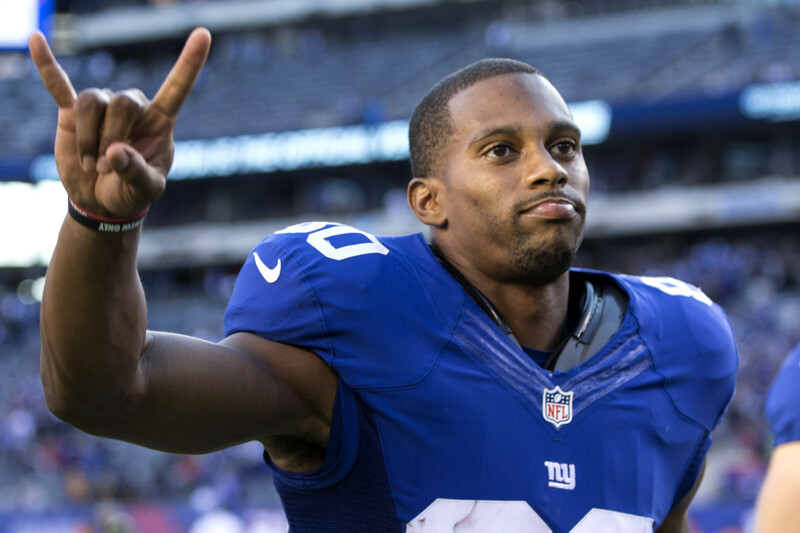 The wideout visited the family for more than three hours, one day after Jack was laid to rest wearing a Victor Cruz jersey. Cruz wrote “Jack Pinto” and “My Hero” on his cleats during a 2012 game against the Atlanta Falcons. A classy gesture by Cruz, who understands his presence can lift a community in unthinkably trying times. In addition to his off-the-field charisma, Cruz recently launched a foundation to help boast the STEM Program, which works to support teachers and students at the U. S. Department of Education and the National Science Foundation. The foundation focuses on teaching children resiliency, commitment and perseverance as essential skills to achieving their goals. On and off the field, Team Vic helps children understand that a healthy mind and body will maximize their potential and allow them to realize a better future. When Cruz is not seen in the Giants locker room, helping out children in need, or dancing his way across your television, he can found working on his clothing line called Young Whales. In the summer of 2010, Cruz and fellow Giants rookie Nate Collins (now with the Chicago Bears) bonded over their passion for fashion. They did some research, and by April they had started a company with initial investments of $5,000 each. By September of 2010, the duo designed their first line of clothes and were ready to sell online. The line’s name plays on the term “whale” being a high-stakes casino gambler. This past offseason, the New York Giants and Cruz agreed on a 6-year deal worth more than $48 million. Most importantly, Cruz receives long-term financial security that is hard to find for an undrafted player who mainly lines up in the slot. The Giants have done a nice job surrounding quarterback Eli Manning with top-shelf talent, and although Cruz was missed early on in camp, he is staying put in New York. The New York Giants open their 2013 season against the Dallas Cowboys on Sunday night September 8th at 8:30 PM EST.